The Davison family is attacked by a gang of masked, ax-wielding assassins during a dinner party for their wedding anniversary. The mysterious killers soon realize that one of the victims has a secret talent and fiercely fights back. That’s for sure. This was a movie that I definitely wanted to see and it was ranked on my wish list as number 1. As a fan of the better slasher films I surely place this one among the other entertaining better movies. Of course it’s not really original or unique. When you’re familiar with the “Friday the 13th” series, you know you can expect it follows the same ritual. 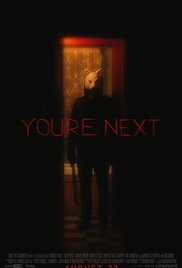 Only this time it’s not a gang of teenagers in a holiday camp who are chased by a mysterious crazy person with a hockey mask, but now it’s about a family reunion which is thoroughly disturbed by several assailants wearing animal masks. And I must admit that sometimes the appearance of those masks in the background was fairly spooky. In other words the structure of the movie is basically the same pattern. First you get to know a group of participants. Thereafter the first victims are piling up. Then the guessing starts. Who will ultimately be the next victim? Was the way he/she was killed inventively? And at the end you start to wonder who is behind all this and what are the motives of this person. The success of a slasher story depends on a few factors. Is there a threatening atmosphere all the time? In what way are the characters butchered and is it an original method ? Does it take long before you begin to suspect someone, who could be the ultimate culprit? If you suspect someone already early in the movie, then this is an indication that it’s a predictable movie. Or they did it intentionally (as in “The Double” which is not a slasher film, but I use it purely as an example). And what surprise is used to end the movie? “You’re next” is not really frightening. There are a few scares (and I definitely had to gasp for breath for a moment) you actually should have seen coming. Most of the times it was just a pleasant and enjoyable movie. Only in the opening scene with the young girl peering into the darkness you can feel a real threat. As the massacre begins you can expect the better chop and cut work. Not everything was surprising, but nevertheless it was explicitly and gross mapped. Certainly the blender part is something different and rarely this fun kitchen tool is being used in this way. The last time I can remember that a blender was used in an unusual way like this, was in “Dead Alive“. The crossbow was something unique too. The rest was just average skewering, cutting and stabbing. It was halfway in the movie when the first idea of who it might be, came up. Eventually I was still a little surprised in the end. The motivation for these gruesome actions became also clear in the end. It’s not really a horror but rather a thriller. Only the end was a little too predictable and gave me a “Yes, of course this would happen”-feeling . Some performances however, weren’t that great. Especially Bowen got on my nerves already early in this movie. And to Margaret Laney I hand over the medal for “Most stupid decision made ever …”. A hysterical shrieking woman, who still wants to hang around in a (not so safe) room on her own. Stupid stupid stupid ….